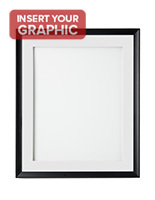 Are you hoping to find black poster frames in several different sizes? 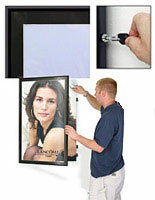 These aluminum graphic displays for walls are sold in 5 different measurements to become the center of attention on in any room. 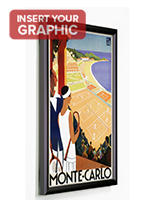 The black poster frames with contemporary or classic styling are ideal for art print presentations in homes or office buildings. 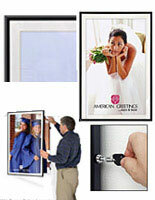 The wholesale aluminum graphic displays are also great for hanging coming soon movie posters in theaters. These mounts have basic framing in concave, convex, slim and wide profiles that helps them to blend into any type of environment. 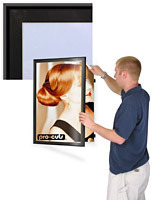 The black poster frames, like aluminum graphic displays, are sold in a satin finish and are available with white, dark, or no matting. 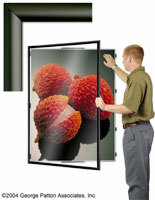 All of these enclosures feature a hinged front door to make for easy access to their interior. 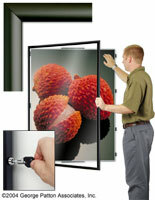 Where are some of the locations that these aluminum graphics displays are often wall mounted? The black poster frames are great for hanging in client waiting areas or hotel lobbies to offer something interesting for customers to gaze at. 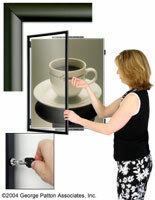 The aluminum displays that lock are great for public spaces, like libraries, schools, government buildings, because they are able to deter vandals and thieves. 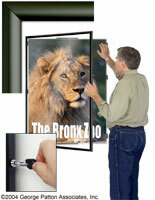 These mounts are also ideal for hanging art prints or favorite movie posters in various home settings like family rooms, play areas, maybe man caves or even gaming centers. 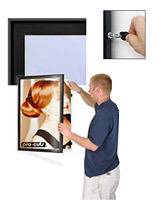 The black poster holders offer a simple, basic design with a finish that doesn’t detract from the signage that is being displayed to keep the focus on advertising and not the framing. The aluminum contemporary displays with raised and lowered edges are available in 3 sizes and also come with 2 mat colors, black and white. 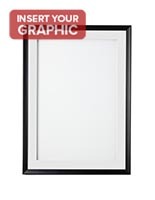 The other more classic poster frames with slim and wide borders come in 4 standard measurements with the thinner black poster holders featuring a white mat and the wider frames having no mat. All the models are wall mounts and come with some sort of plastic or acrylic lens or panel to protect the images placed inside. 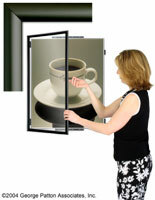 The aluminum framing features 2 loading styles one where the signage is fitted into the hinged door and the other that attaches to the back board with clips or tape. Also, the majority of these affordable basic styles have a locking counterpart that is able to deter theft and helps prevent damage to presented images. 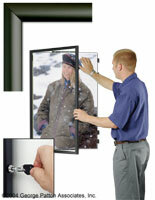 Some of those movie poster mounts that don’t have a lock do feature a gravity latch system that keep the hinged doors closed to prevent opening in high wind or if someone happens to bump into them. 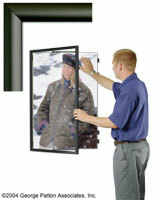 The aluminum is durable and will last even when hung in retail settings. 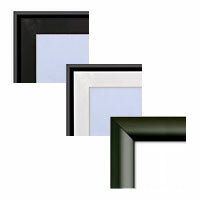 The black finish is and basic design also allows all of these frames the ability to coordinate with any color palette or room décor.